In the past few weeks we received many requests for more customization features for both the Bookmarks and RSS widgets. Last week we worked on some cool new features that were deployed today. We hope you like them. It is now possible to select how many articles will be shown with a summary. Previously, only the first article could be shown with an image and introduction text. Now one, two, three or all articles can be shown this way. With this new settings an RSS widget can be configured that is much more ‘magazine like’. The image that is shown in front of article summaries can now be disabled. Not all feeds provide images consistently. By disabling images, a calmer news display can be obtained. For feeds with long article titles, it can be interesting to switch of title trimming for the article summaries. 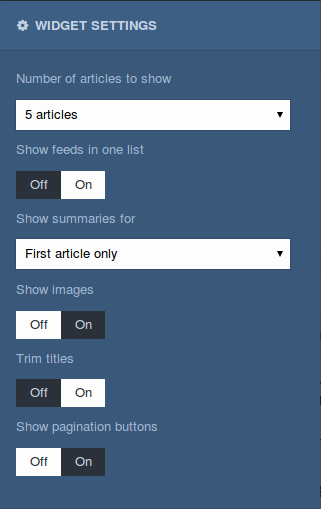 We applied some other minor tweaks to the RSS widget, including some speed improvements for pagination. The bookmarks widget now has a second display mode: the Icon View. This mode can easily be selected from the dropdown menu and shows the bookmarks as large icons. This layout may actually save some screen estate on larger screens and is especially useful for the sites you use most often. For those that have long lists of bookmarks, we added a nifty sort feature. 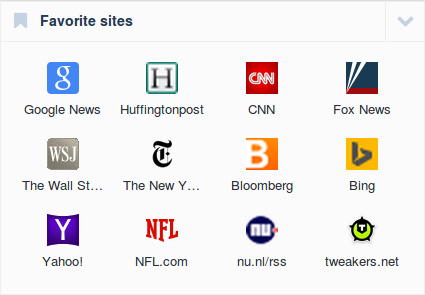 You can now have start.me sort all bookmarks in a widget by title, URL or age. That should help you get organized again! 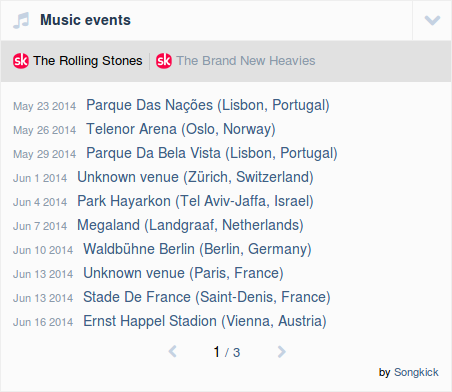 For music loving start.me users we added a Music Events widget, that will show all events for a specific artist, venue or area. The data is provided by Songkick. It seems the new RSS setttings are only available on newly created RSS widgets? My ‘old’ RSS widgets don’t display any of the new options, a newly created on does. Figure it out – the ‘images’ and ‘trim titles’ options are only available if you show at least one summary. It is a very nice feature especially the very big photos for picture rss like the comic feature. But the squares for small picture settings are super midget and cut things off. But when I choose super big pictures they are above those feeds. Is it possible to choose that they are always on the left of the feed? Or just a portrait mode of the small pictures thus the pictures will be useful. Thank you very much for implementing all those requested features. Btw does the beta turns into a final version? Nice to hear you like the new photo feature. Today we made the thumbnails a little larger (when there is room) as well, making that mode more interesting as well. Thanks for the great suggestion!